Every meal at RockSugar comes with complimentary black sesame rice crackers with a spicy tomato chutney. A fresh alternative from the typical bread and butter. I started with the Chicken Samosas. Packed with curry flavor, I rather enjoyed the ground chicken and veggie samosas, especially in combination with the cooling cilantro yogurt dipping sauce. Next up was the Indian Stuffed Flatbread w/ Beef, which was a sort of naan-like quesadilla. Although the actual "flatbread" didn't blow me away, the chili-ketchup dipping sauce was tasty. This item actually reminded of that canceled NBC show, "America's Next Great Restaurant." One of the contestants attempted to open a fast casual Indian food chain and the judges were pushing an "Indian taco" on him. I imagine this would be the result. Third up were the Chicken Imperial Rolls. Chef Mohan Ismail encouraged me to make little lettuce wraps with these - and while I love lettuce wraps, due to the bulk of the (even halved) Imperial Rolls, it made it a little difficult to eat. Nonetheless, the lettuce wrap of Imperial Roll, cilantro, vermicelli rice noodles and the sweet, yet spicy nuoc cham sauce really pleased. 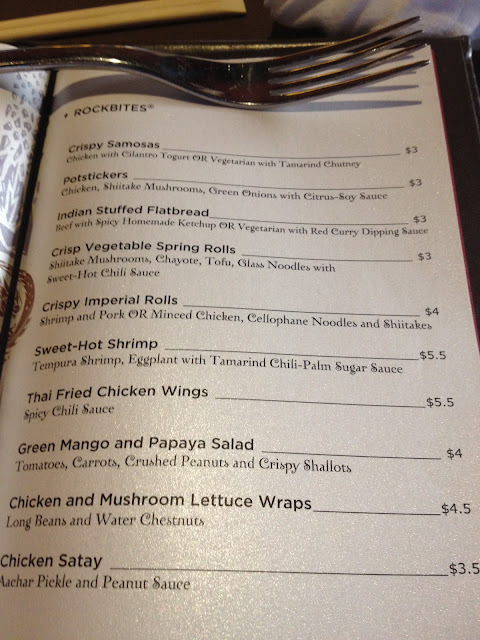 I followed the Imperial Rolls with Chicken Potstickers. 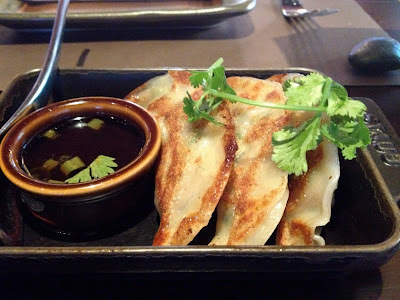 They were large and quite tasty for chicken potstickers (which often are blander than other meat fillings). My final course was Thai Chicken Wings, which I really enjoyed. This despite the fact that the wings were clearly incredibly fresh out of the deep fryer, making them almost too hot to handle and eat for a good five minutes after I received them. When they finally did cool down though, I found them to be sticky and spicy like they should be. The RockTail menu also features a decent cocktail menu for the very reasonable $6. Well drinks go for $5, wine for $5 and beer for $4. Overall, I would say RockSugar didn't overwhelm me, but did impress me a tad. I went in with very low expectations, but after sampling five of their RockTail items, I definitely would recommend it to people searching for a decent Happy Hour in Century City. Every item comes with a unique dipping sauce - and the presentation in little Staub cast-irons is a classy touch. While it certainly is not the pinnacle of LA Asian cooking, the restaurant (and Happy Hour) offers one of the city's most diverse and massive Pan-Asian menus. In doing so, RockSugar enables couples and families with discerning members the ability to please everyone. You don't like Indian, but your girlfriend does? You like Thai, but she doesn't? 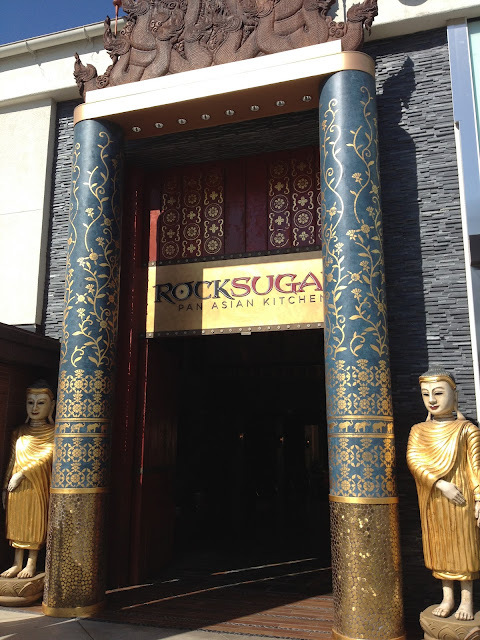 RockSugar is your place. Rocktail Menu - Daily 4-6:30 pm. Sorry for the tangential comment, but your reference to America's Next Great Restaurant reminded me how angry that show made me. Why the hell didn't the Indian guy just make street food like samosas and kati rolls (which are like Indian burritos)? There's already a rich cultural tradition of portable foods that's been refined and perfected over centuries. It absolutely floored me how clueless he and the judges were.